The entire Northwoods community has seen a rise in thefts and burglaries. Perhaps it is due to the economy falling on hard times. Over the summer there was some theft reported in the Squash Lake neighborhoods. Gas and batteries were stolen from boats and a leaf blower was taken. Residents have seen unfamiliar people walking the shores of the lake. Lately there have been burglaries. It might be time to join the efforts of the Oneida County Sheriff’s Department and start the Neighborhood Watch program here on Squash Lake. The purpose of this program is to form a partnership between the citizens and the law enforcement to reduce crime in our community. 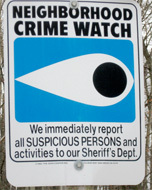 Let’s create Neighborhood Watch sections within our Squash Lake community. Possible individual sections could be: Squash Lake Rd; Long Lake Rd; Hwy 8/Lake Rest Rd; Bay Dr; Bay Rd; Crestwood; etc. Any community member can become the organizer for their section. Contact Sara Wolosek at swolosek@co.oneida.wi.us or call the Sheriff’s Dept at 715 361 5100 and tell them you are interested in the Neighborhood Watch program. If you do observe suspicious activity, write down the details (license number, person’s appearance, time, etc.) and anonymously report to WeTip Hotline at 1 800 78 CRIME or email http://www.wetip.com Cash rewards up to $1,000 are given to tips that lead to arrests and convictions. It pays to watch out for your neighborhood. Let’s keep our neighborhood safe. Get involved!